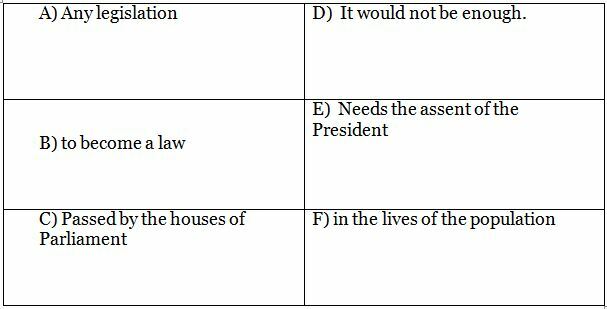 Direction (1-10): In the following questions two columns are given containing three sentences/phrases each. In first column, sentences/phrases are A, B and C and in the second column the sentences/phrases are D, E and F) A sentence/phrase from the first column may or may not connect with another sentence/phrase from the second column to make a grammatically and contextually correct sentence) Each question has five options, four of which display the sequence(s) in which the sentences/phrases can be joined to form a grammatically and contextually correct sentence) If none of the options given forms a correct sentence after combination, mark (e), i.e) “None of these” as your answer. The lenders will form an interim management to monitor daily cash flow and operations. 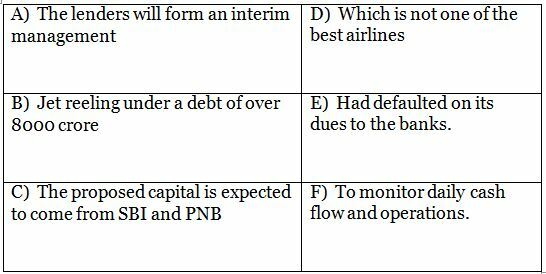 Jet reeling under a debt of over 8000 crore had defaulted on its dues to the banks.